I am a big fan of bread. Such a big fan, in fact, that sometimes I will choose to have an extra piece after dinner in lieu of a second pour of wine, or even dessert. In the last year or so I started dabbling with bread baking, lots of quick fruit breads, a few loaves of whole wheat, some scones, even some fabulous dinner rolls at Thanksgiving. But biscuits have always frightened me, just a bit. I’ve heard horror stories of folks attempting to make biscuits and ending up instead with pancakes, or worse, hockey pucks. Because of this fear I am always amazed when I come across a really fabulous biscuit. Mother’s in New Orleans bakes one of my favorites, so good that Brian and I stop by the restaurant on our way out of the city to load up on the black ham variety to eat on the plane ride home. (The unbelievable ham they produce has something to do with that stop as well...the last time we were there we bought a cooler just so we could bring a few pounds of it home with us.) 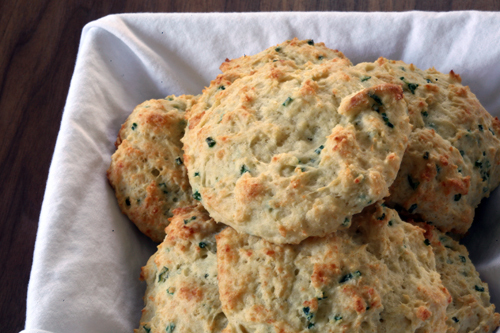 And then there are the cheddar biscuits at Red Lobster, a restaurant I haven’t been to since I was a teenager. Even after my 10+ year absence from the establishment the memory of those golden lumps is still crystal clear. When Foodbuzz contacted me a few weeks ago to find out if I would like to sample some Kerrygold products (yes!) all I could think about was cheddar biscuits. 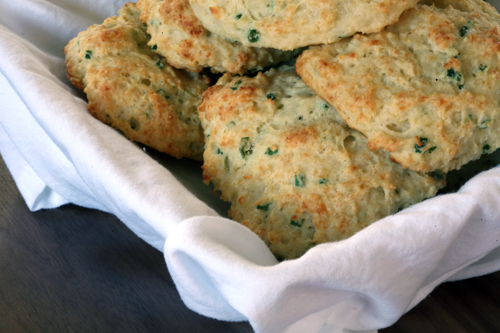 After the chives popped up in the garden my intent was set - cheesy, chive-y buttermilk biscuits would be gracing our breakfast table, and hopefully they would be soft and flakey as well. 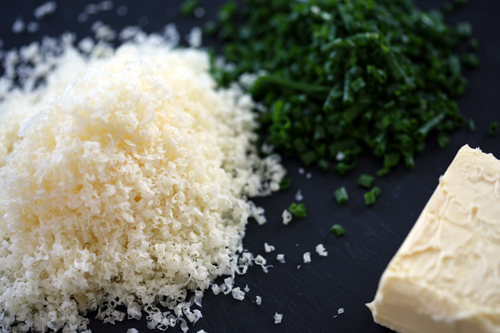 I decided that even if I failed at the texture, the power of delicious Irish cheese and fresh chives would carry them. 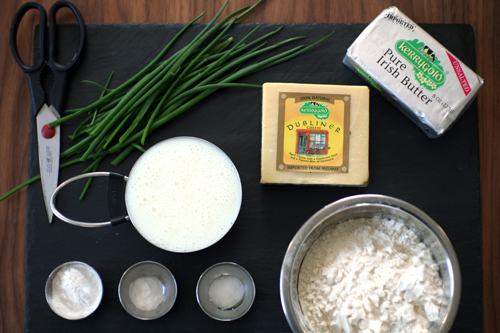 I found this recipe at Thibeault’s Table via Tastespotting. It was easy enough, delicious, and though my batch didn’t turn out as beautifully as the photos accompanying the recipe, they weren’t pancakes or hockey pucks which relieved me greatly. 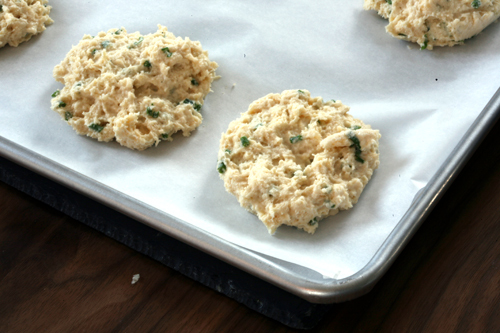 I was amazed by their lightness...prior to this experience my most recent biscuit-like endeavor was of the hearty oat variety (recipe will come, I’m still perfecting it) which, compared to these, sit like bricks in your belly. My technique needs some work. The recipe didn’t call for a specific amount of cheese so I guessed, which may be the reason why my biscuits didn’t puff up quite as beautifully as the example. Or it could be the fact that a bit of time passed before the ingredients pulled from the fridge were incorporated into a batter and then stuck in the oven...the problem with photographing as you go. But the flavor was great, and Brian has requested that they be added to the permanent rotation for indulgent weekend breakfasts. It seems like I will have plenty of opportunity to perfect the consistency. And I have to say, the Kerrygold Dubliner cheese was excellent. So good that the first block I bought was consumed with a loaf of crusty bread before ever making it into the biscuits it was intended for. 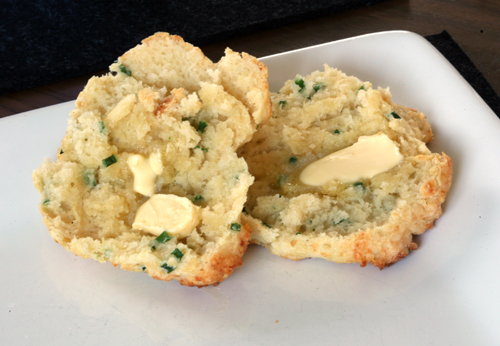 The Pure Irish Butter is also delicious, although I think it may be too soft for this recipe. My batter was very sticky, which may have also contributed to the lack of puffiness. But spread across the top of a fresh-from-the-oven biscuit? Perfect. 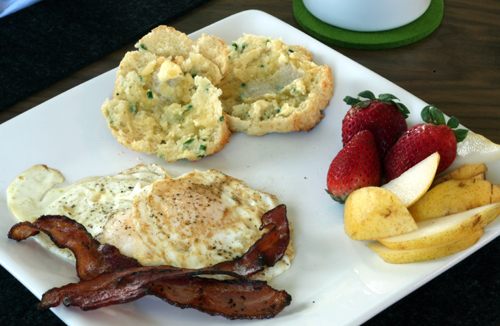 Oh yes, it was a weekend filled with indulgent breakfasts. Is that bacon on my plate?!? What?!? I"ll be sharing another breakfast with you this week, but it is of the sweet variety and involves oatmeal. Get excited, because it is fabulous. :) And its healthier than eggs, bacon and biscuits, so who wouldn't be excited?